Stetson was born and raised in Ann Arbor, MI, and earned a degree in music from his hometown school, the University of Michigan, in 1997. Six years in San Francisco followed, then another four in Brooklyn, NY. 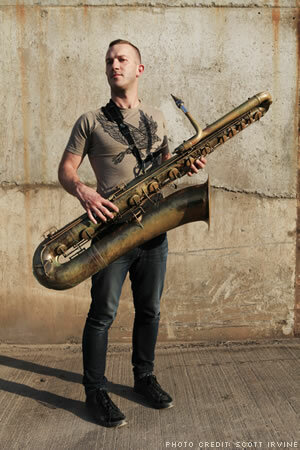 Over this time, he developed his unique solo voice on saxophones and clarinets, culminating in the release of the record "New History Warfare, Vol.1", in 2008. Stetson now resides in Montreal, QC, and performs regularly on assorted saxohones, clarinets, cornet, french horn and flute. Aside from his work as a soloist, Stetson has brought his talents to the stage and studio with dozens of artists, including Tom Waits, Arcade Fire, TV on the Radio, Fiest, Bon Iver, Laurie Anderson, Lou Reed, David Byrne, Jolie Holland, Sinead O'Connor, LCD Soundsystem, The National, Angelique Kidjo, and Anthony Braxton. He is also a regular member of the bands, Sway Machinery and Bell Orchestre.